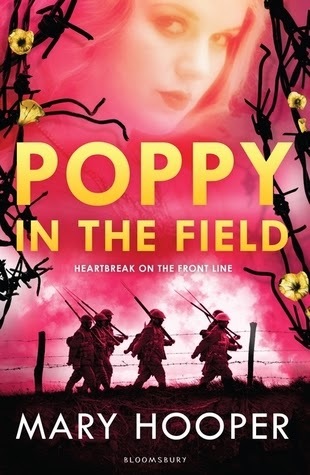 I absolutely loved the first book in this duology, Poppy, and was hugely, incredibly excited to find out how the story would end in this fantastic sequel, Poppy in the Field by Mary Hooper! It's being published by Bloomsbury on the 7th of May, and honestly? It's well worth reading. I think what I loved so much about Poppy and about Poppy in the Field is that Mary Hooper has this fantastic way of weaving in great amounts of historical detail into an interesting narrative without the story feeling in any way educational or bogged down. Everything flows very naturally and it's all incredibly fascinating. That's what I felt when I was reading both books. But I also really cared for Poppy and her friends and family. And about the men who she comes across in her job as a voluntary nurse during World War I. Some of these men only come briefly into the story but all of the soldiers ended up having an impact on the story. And then there's the romance element. Despite the tag line on this book - 'Heartbreak on the front line' - I think another one of my favourite elements of these two stories is that there is a romantic aspect to the story, but Poppy's own experiences in the war effort, her relationships with the other nurses and telling the stories of women in WWI and of the soldiers' experiences and the different medical advances that take place, for me anyway, are at the forefront of these two books. And there is also a very satisfying and sweet and rather subtle romance as well. The rest of this review will contain spoilers for the first book in the series, Poppy. If you have not yet read that book, and would like to, perhaps it would be best if you stopped reading now. Poppy in the Field begins shortly after the dramatic ending of Poppy in which Poppy has found out that her sweetheart, Freddie de Vere, is now engaged to another woman and will be getting married very shortly. Poppy decides very suddenly to put her name down to volunteer as a nurse on the front line in an attempt to get over her broken heart. She knows it will be much more dangerous and difficult working overseas but she feels like this is a necessary change and she likes the idea of being useful during the war. Unfortunately for Poppy, at the start, things don't go as well as she'd like. She's assigned to a difficult ward Sister who gives her very little responsibility and the other nurses are unfriendly and stand-offish. Together with her broken heart, Poppy must muddle through. And I loved seeing how well Poppy picks herself up following adversity. Just as in the previous book, Poppy finds herself with some other nurse friends and endearing herself to her soldier patients. There are letters to her mother, her brother, the family friend who is supporting Poppy financially as a nurse and letters to Poppy's friend, Matthews. New characters are introduced in the form of American nurses, Dot and Tilly and old faces return such as Doctor Michael Archer. And throughout we have Poppy Pearson, this strong, capable young woman taking things in her stride and doing the best she can. As I said above, I really love how much historical detail there is in this book without it ever feeling like it's crammed packed with history. It's just happens naturally in Poppy's conversations with those around her and we get a great glimpse of what the war was like in 1916. I loved Poppy as a character. I loved her courage and tenacity. I loved her friendships and how professional she is as a volunteer nurse. I loved that she was heartbroken but still carried on as usual and eventually moves on. Poppy in the Field was a wonderful conclusion to Poppy's story and I really urge you to read it!